Even before the vote is in on ballot measure IP28, Kate Brown has pitched how she’d spend the money—all 6 billion. Yep, she’s crafted her “Corporate Tax Implementation Plan” without an inkling of remorse over the impact the latest money grab would have on hardworking Oregonians. While IP28 is written as a “corporate tax,” the reality is it would hit working Oregonians to the tune of roughly $1,500 per household, based on the estimated impact of $600 per Oregonian and the size of the average household in Oregon of 2.50 individuals. That’s more money for big government and less for individual and community innovation. Bud’s position is based in part on a review of the law’s impact by Oregon’s Legislative Revenue Office. 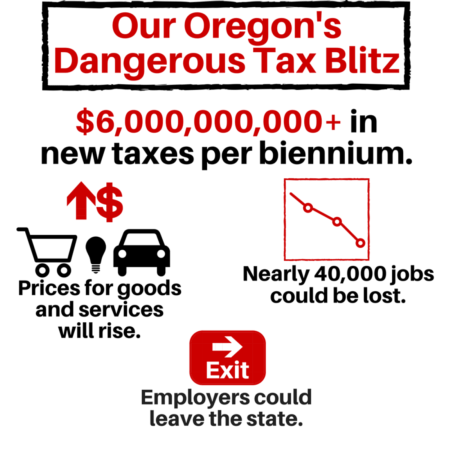 Their May analysis revealed, “The Impact of IP28 on consumer prices means the marginal impact of the tax on the distribution of the state and local tax burden would be regressive.” Meaning everyday Oregonians, not corporations, would bear the weight of the 6 billion dollar tax hike. The report showed that people earning between $21,000 and $48,000 would feel the most impact under the law. In addition, they estimated the initiative would cost Oregon nearly 40,000 private sector jobs. Sure it would move more money into big government, but current leaders lack vision and have failed to deliver in the past. Think “Cover Oregon” or the “Columbia River Crossing”. They are professionals at developing new tax plans, but lack smart spending plans needed to deliver the outcomes of excellence Oregon deserves. Brown stated this week she is “building the boat before the tide rises.” The fact is she’s already spent years building an over-sized ark laden with holes. Another boat crafted by failing one-party rule will not float. It will sink and take Oregon with it. It’s time for change. Pierce plans to accomplish the objectives Oregonian’s value including improved graduation rates, health care, and senior services by smart spending of existing dollars. While it may be appealing to “make the corporations pay,” we need to look in the mirror and realize we’d pay to the tune of $6 billion dollars.